Jessie Street Designs: Tutorial Tuesday at Happy Hour Projects! Happy Tutorial Tuesday!! Today I am hanging out with Adrianne at Happy Hour Projects where I'm sharing the tutorial for these super cute and extremely easy tea towels!! Be sure to stop by and say hello! Wanna know a little secret??? 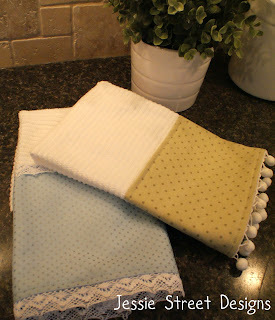 You can WIN these tea towels (and other awesome stuff) in my VERY FIRST giveaway!! !